This article assumes that you know what an outliner is. Not familiar with outliners? Read our Outliner 101 guide first. The layout of Dynalist is fairly simple. You can use them to search and control what you see in the current document. On the left there are a few panes you can open. There's one for managing documents and another for managing bookmarks. At the top right corner lives feature updates (the megaphone), settings, and the main menu, along with the current sync status. The most frequently used actions are item related, which correspond to the most basic features of an outliner. To create a new item, put the cursor at the end of an item and press Enter. To indent the current item, press Tab. To unindent (opposite of indenting), press Shift and Tab together. To collapse or expand an item, click its bullet point. The icon with three lines will open the item menu. We'll talk about that in the next section. The magnifying glass icon will zoom in/hoist the item. A + or - icon will appear in the place of the magnifying glass. Click them to collapse or expand the item. Usually, you'll need to create a new documents to get started with Dynalist, here's how. 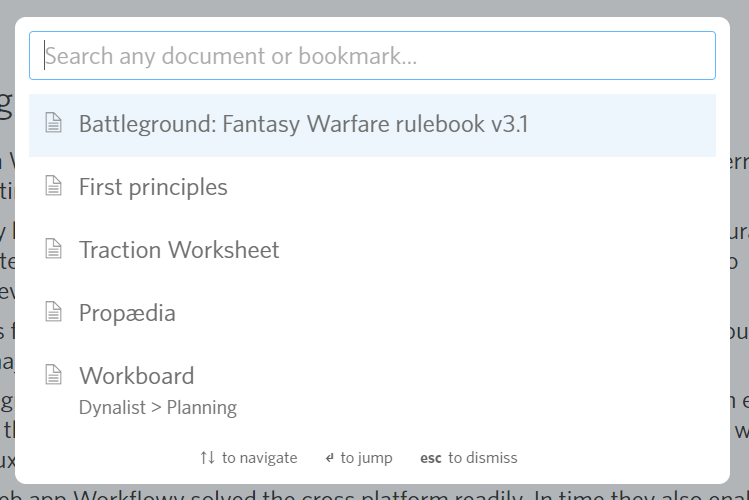 To rename, delete, or share a document, right click on the document in the left pane and use the menu. What shows up on the menu also depends on the item itself. For example, if an item is at the top level and cannot be further unindented, the "Unindent" option will not show up for that item. 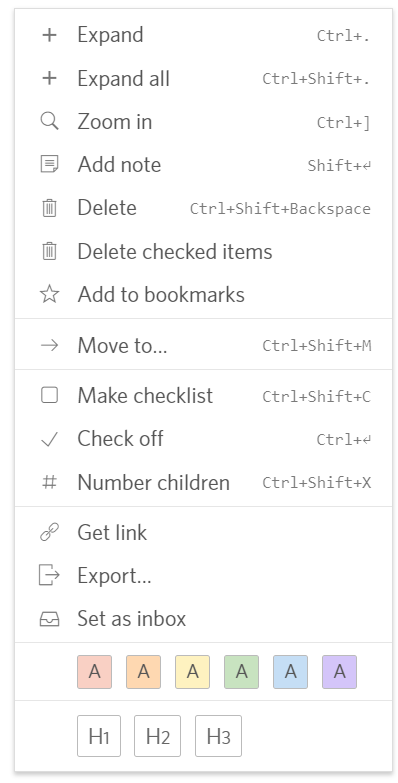 Keyboard shortcuts is a must-use to be efficient in using Dynalist. This pane can be closed by pressing Ctrl/Cmd+? again or clicking on the "X" at the top right corner of the pane. For a list of default shortcuts, see here. You can use Dynalist-flavored Markdown to format things. That includes bold, italics, links, images, and so on. Here's a complete list of available formatting options. You can turn any list into a checklist. This will add a checkbox before each subnode and subnodes of subnodes. This makes items easier to check off. Note that you can check off normal items too with the item menu or the shortcut. You can enter dates too. With Dynalist Pro, you can enable Google Calendar integration to sync dates in Dynalist to Google Calendar. There are a few ways to go to another document. The simplest and most intuitive one is to click on a document in the left pane to switch to it. 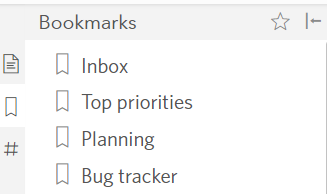 You can do the same for bookmarks. Or if you prefer staying on your keyboard, you can use Ctrl/Cmd+O to open the file finder and search up the place you want to go. Hit Enter and there you are! Browser navigation also works within Dynalist. You can use Back to go back to the previous location and Forward to next location.